Tucked into our santa sacks was the Government’s half year financial outlook, MYEFO. Unfortunately, it was a litany of cuts to the carbon price and related programs as energy and climate policies took a heavy pounding. 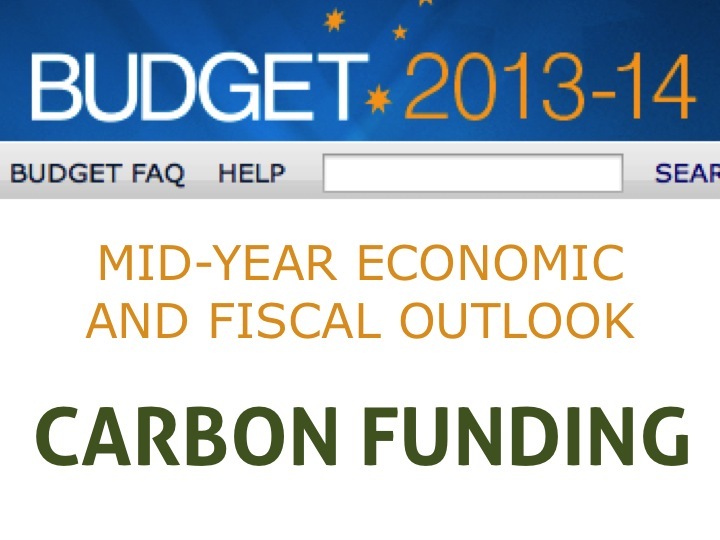 The Indigenous Carbon Farming Fund did not escape – the program will be closed by 30 June 2014. All other land sectors programs, including the Biodiversity Fund, will also close. I’ve updated our funding page to reflect these official changes. I’ve also tallied all the relevant funding changes in this document. This is not an unexpected result and many still have grants to check out opportunities on their land. Indications to date are that existing grants will run for their contract period. Keep at it. Still, the extent of cuts certainly leans in one direction and takes wind out of the sails. Investment in land sector abatement is still soft and no new encouragement is offered. Tucked away are a couple of curly ones. At this stage, no funding has been allocated to the Emissions Reduction Fund, although the Green Army to plant trees was funded. It also shows the extent of revenue lost if the carbon price is abolished – estimated to be $13 billion over the forward estimates. Fortunately most of the fruit from the Clean Energy Future package is out there. For the moment, Aboriginal carbon farmers will have to use what we’ve got. Will be watching the budget with interest. Newer PostGreen Paper: cracks of light?